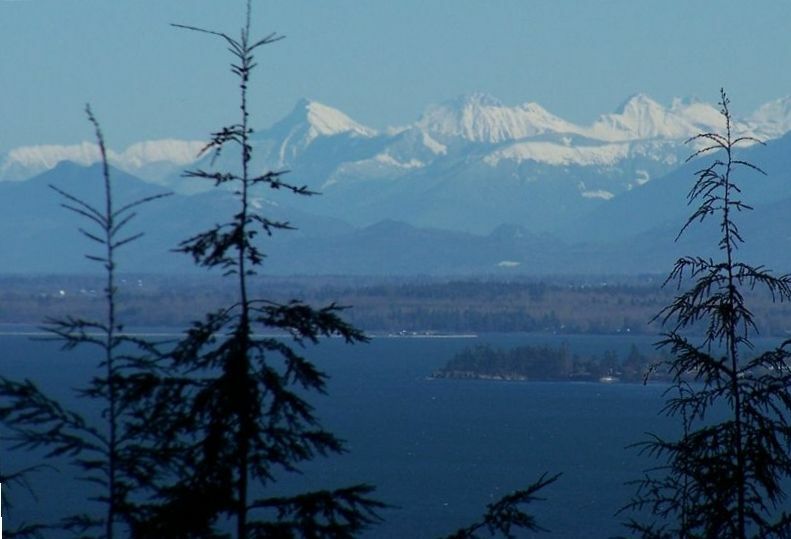 Enjoy being nestled among the tall Fir trees with views of the Georgia Strait and the Cascade Mountains. This 3-acre piece of paradise is a hillside covered with natural flora and fauna, on a private paved road, only 4 miles and just minutes from the center of Eastsound, and 15 miles from the ferry terminal on Orcas Island. The home has an open floor plan. The Great Room is comfortably appointed with new leather seating includes 4 recliners, and has an extra large sky-lite, positioned over the peak of the roof. Relax on the couch and watch the white, wispy clouds float overhead or enjoy the gentle swaying of the tips of the tall Fir Trees. There is a large flat screen Smart TV, DVD/VHS /Blueray players and WiFi computer signal, over 150 movies and 60 Cd's, double doors open onto the patio, and THE VIEW. The Kitchen has butcher block counters, dishwasher with detergent, full sized stove and oven, full-sized refrigerator with cold filtered water and ice maker in the door, microwave, toaster oven, coffee maker and blender. A complete selection of stainless steel pans. Utensils. Flour, sugar, spices and basic condiments are there for your use. If it's in the kitchen, feel free to use it while you are staying at the house. There is a 11' island counter with 7 bar stools that face the work area so you may visit with the cook, a dining room table that seats 6, double doors open onto the patio, and THE VIEW. The Master Bedroom has a king sized bed with a med/firm mattress, a leather love seat for quiet reading, a large desk for private writing, a electric fireplace, a TV with DVD/VHS player, a bookcase with wide cross-section of titles, a cd player that will accept your i-pod, double doors open onto the patio, and THE VIEW. The Master Bathroom has a deep jacuzzi tub, a slate-lined walk-in shower hall 3 ft. x 6 ft. with two height adjustable shower heads. Candles around the tub for that extra ambiance for a private relax, plenty of white towels and a sky lite. There second bedroom and bathroom are at the other end of the house. That bedroom has a med. firm queen-sized mattress with a 3-inch memory foam mattress topper, a desk area, bookshelves and a dresser. There are 2 big windows and The View. The second bathroom may be entered from the second bedroom or from the kitchen area. This home is perfect for two couples. The house is built on a steep hillside that is not fenced off from the patio so may not be suitable for toddlers.or young children. The spacious stone patio is ideal for sitting day or night. There is a out-side fire pit with some firewood provided. BB-Q over a charcoal grill, some charcoal is provided. There are 4 reclining lounge chairs. Enjoy outdoor dinning around the table chairs 4 and with a cloth sun shade umbrella. And THE VIEW. A wonderful place for your first cup of coffee in the morning. The rent is set for 4 persons per night staying at the house. An additional $50.00 per person per night will be added when over the 4 person occupancy. There is a self-inflating/deflating Queen sized air mattress that stands about knee high and can be set up in the great room. This can be set up if you need it. I'm pleased you are here to enjoy the house I built. I'm proud of it. The income I make by renting to you allows me to take art courses and to take time to create the art that bring me so much joy so Thank you. I have a separate entrance and can't see into the windows or onto the private patio or the rented part of the house. The only place you might see me is in the parking area. July-August-September I do not live at the Delongview house. This Island offered the clean air and lush green landscape that has always been important to my comfort in a place. I need tall trees, natural settings, wild animals and birds as part of my daily life. The ocean being near-by and viewable daily, around nearly every corner I turn or hill I drive over, is a blessing I don't take for-granted. The views of the awesome mountains were a plus, and now I can't think of life without them to gaze at. The fact that there are no traffic jambs or stop lights have to be listed as a plus too. The peace and serenity you feel sitting on the patio with the sight of the Cascade Mountains and the Georgia Strait right there. Flowers blooming all around and birds to watch as their songs fill the air. The quiet of living on a 3 acre piece of paradise, on a private road, with no through traffic or city noises. Not another house in sight. If the weather is overcast or if it has snowed and all is covered, it still feels bright in the Great Room, due to the huge ski-lite over the peak of the roof. The heated slate floors with rich, bold colors feel warm to my bare feet in the winter, and cool when I take feet out of my hot shoes in the summer. So many things like this are what makes my home special to me, and to you too if you want. House sits high above a private road with no through traffic but only 4 miles from the center of Eastsound for restaurants and shopping. The Cascade Mountains majestic beauty may be seen from the comfort of your reclining deck chair, as you sip on something cold. This house is 500+ feet above the Strait of Georgia, where many ships can be seen, but not heard, passing by. Electric fireplace in the master bedroom for ambiance. full sized refrigerator with ice maker, dish washer & soap, microwave, toaster oven, full oven and stove, double sink. Coffee maker & coffee. Stainless steel pans. Dinning table & four chairs with shade umbrella. 4 new reclining chairs. Many pots of flowers. Fire-pit and some fire wood. The sounds of a creek running near by can be heard most of the year. Spacious open floor plan and large windows. Approximately 1700 sq. ft. house space and 900 sq. ft. patio space. Lovely house, with an amazing view. Big kitchen, with almost any utensil you would need. Location is amazing, only about 10 minutes to Eastsound, but feels almost completely private. If Donna's house is available, don't hesitate. Enjoyed our Orcas vacation and Donna's house was big part of the enjoyment. This home is fabulous!! We loved every minute of our stay here!! The views are beyond amazing!! The home is very comfortable and has everything you need to make wonderful meals....we were very happy with everything!! The back patio area was so nice and we loved sitting out there around the fire pit. The firewood was even provided. Thank you for thinking of everything! This home has a truly luxurious interior, but yet remains quite comfortable and welcoming. The outdoor space is stunning with lovely views of the sound and surrounded by majestic evergreens. Loved sitting out on the flagstone patio -- enjoying the tranquility and songs of the birds and tree frogs. This home was very comfortable and well-appointed.The kitchen was inviting with everything we need to cook meals at home. The view would have been amazing but we had hazy weather with the addition of smoke haze! We really enjoyed our stay. The view is wonderful of course. The decor is very nice. The house has just about everything you could need. A nice thing is that that house is a bit off the beaten path and allows privacy and a real sense of home. We fell in love with Orcas Island. Hope to return again in the near future. I am pleased you are here to enjoy the house I'm proud I built. The income I make by renting to you allows me to take art courses and to take time to create art. That brings me joy so Thank you. I work full time but I can help with any questions you have. I live in a studio apartment at the house under the second bedroom. I can not see into the windows or onto the private patio of the rented part of the house so your privacy is assured. The only place you might see me is in the parking area. I will not be in contact unless we email, call or schedule a time for a visit while you're here.